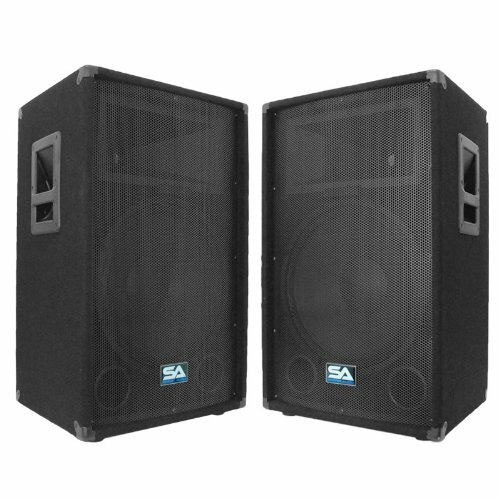 Pair of Professional 15" Speaker MainsModel #: SA-15T (Set of 2). 15" Woofer. 350 Watts RMS; 700 Watts Peak per cabinet. Woofer has 50 ounce magnet and 2.5" kapton voice coil. 1.5" Titanium tweeter driver with 10 ounce magnet and 1" throat. Two 1/4" inputs and two Speakon inputs. Frequency Response: 45Hz to 20kHz. Crossover: 12/18db per octave 3K hz high power with dual glass bulb tweeter protection. Impedance: 8 Ohms. Sensitivity: 96 db. Dual ports. Full metal grill. Recessed Handles. Black carpeted covering with black metal corners. LxWxD: 25"x20"x16". Weight: 52 lbs per cabinet. Condition: New. One Year WarrantyThis listing is for a pair of these 15" speaker cabinets. You will receive two identical speaker cabinets, pictured and described above. Each speaker cabinet has the specs above.These amazing 15 inch Speaker Cabinets deliver every sound loud and clear with a 15 inch woofer, 1.5 inch titanium tweeter driver, a frequency response of 45Hz to 20,000Hz, and 350 watts RMS, 700 watts peak power per cabinet. It doesn't matter if you are doing a DJ gig, a wedding, a church event, or a club gig, these speakers will deliver the sound you want! Great quality mains are very hard to find, especially at a decent price. The Seismic Audio brand was designed to make the professional musician, as well as the musician low on cash, sound great. With your purchase, you will receive a pair of 15" Speaker Cabinets pictured and described above. So, put it in your cart today and get ready for years of trouble-free, crystal clear sound!